so we also celebrated my dad and sister's birthdays (same day) a little early on our camping trip - yummy strawberry shortcake - and gifts. i made my sister this bag - which was really fun to make. 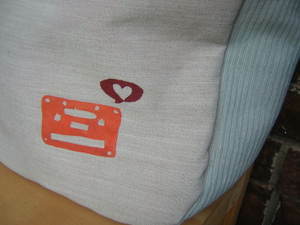 thrifted fabric + freezer paper stencilling = fun bag! it turned out pretty good, i think - my first time trying to make one with gussets (gussetting?). the front and back panels are out of a grey suiting-type fabric, the sides, bottom, and handle of grey-blue corduroy, and the inside out of crazy orange and white floral. she liked it, which was good - i would have taken it back otherwise...! :) i think what i've enjoyed most about making bags as gifts is trying to make one that 'looks like' the person who will receive it. some i've done better than others - but this one is very 'kari', i think! 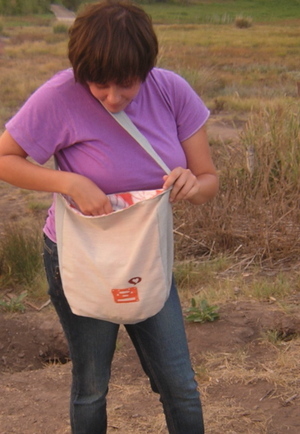 here's my sister, kari, trying out the cell-phone pocket in the bag. i did a couple of other last-minute camping crafts - as i'm packing our grubby sweatshirts i decided they needed a little sprucing. i stencilled on a couple of sweatshirts - you can see them here.